Benjo Bags offers a brilliant and unique way of creating branded party bags, Junior Membership Bags, Outreach Marketing Bags and Event Bags with low volume requirements to suit everyone’s budget. The branded card sleeve drops neatly into a clear grip sealed bag with handle and feature the same design front and back to create a brilliant bag design. The designs featured above can be incorporated with your logo and voucher codes, or alternatively a unique and bespoke design can be developed by our design team to meet your specific criteria, corporate imagery and colours. 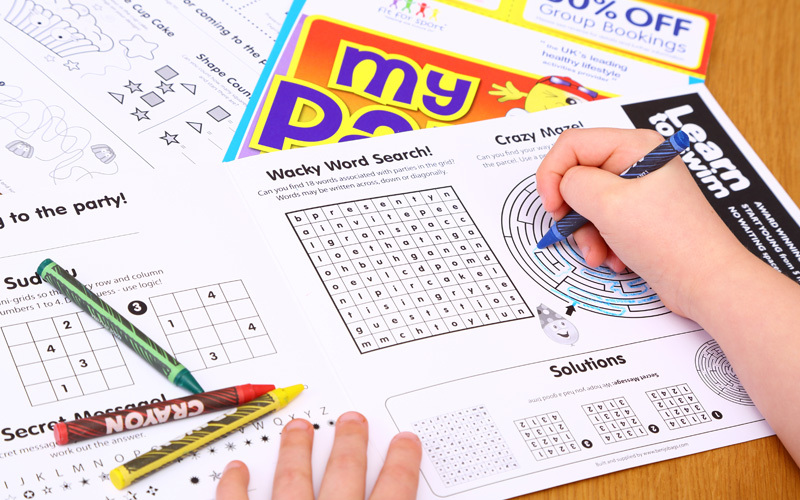 The reverse of the sleeve can feature brilliant age appropriate activity page including puzzles, brain teasers, colouring activities and games. The design of the sleeve creates voucher areas at the top of both the front and back of the sleeve to communicate your offers to your existing and potential new customers. The voucher / offer area are a great way to capturing your potential new customer’s data and can be used to offer a loyalty card, discount voucher offers, free gift offers, customer competitions, group booking discounts or just highlight all the products and services available to your customers. 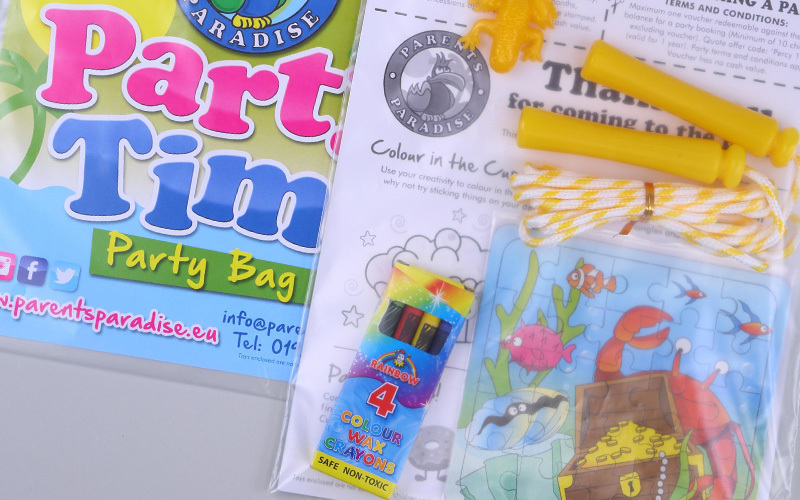 The toys can be appropriate to a particular age group, unisex or for boys or girls and typically includes a crayons / pencil pack so the activity page can be used and enjoyed by your guests immediately. Additional numbers of toys can be added on request to suit your budget. All artwork including adding your logos, corporate branding and offers to the sleeve can be managed by our design team. The process of creating a bespoke product can be lengthy, however you can take delivery of your unique bags within as little as 7-10 days from signing off on your design, (although we do recommend planning a little further in advance). This creates great flexibility with the timing of your offers and vouchers, and huge benefits from avoiding lengthy delays from overseas production. Our low minimum mean no more ordering in bulk and having to store boxes and boxes of party bags, offers and designs can be changed to link in with your marketing plan. 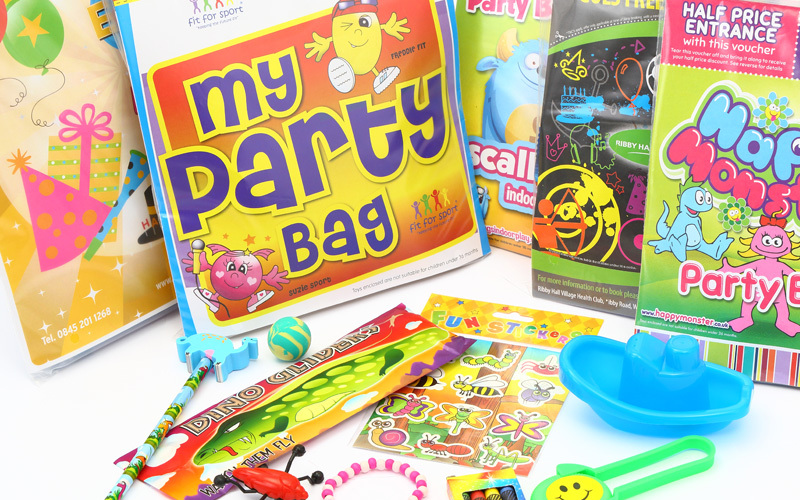 Our prices are competitive and include, clear resealable bag, your company branded activity sleeve, toys and fillers of your choice, all packed ready to hand out. 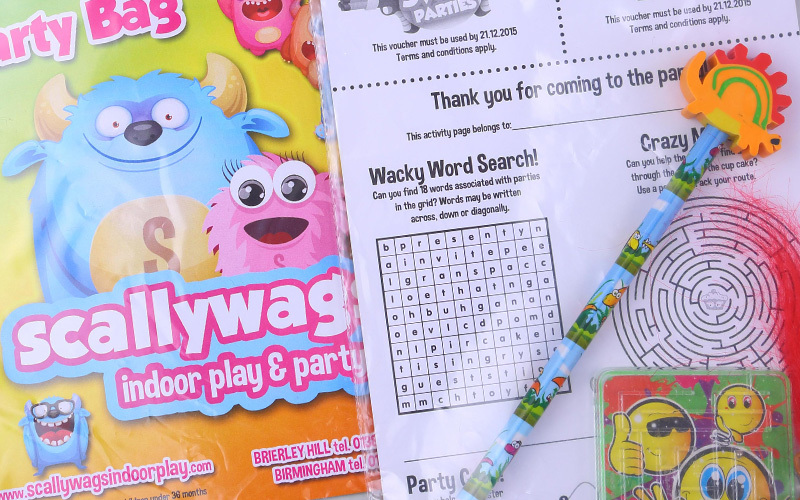 The activity sleeves engages the children and can include age appropriate games and activities which is an additional extra that makes our party bags unique. Safety of our products is an absolute priority, please check age recommendations on the packaging and any age warnings. Always read and follow manufacturer’s instructions. 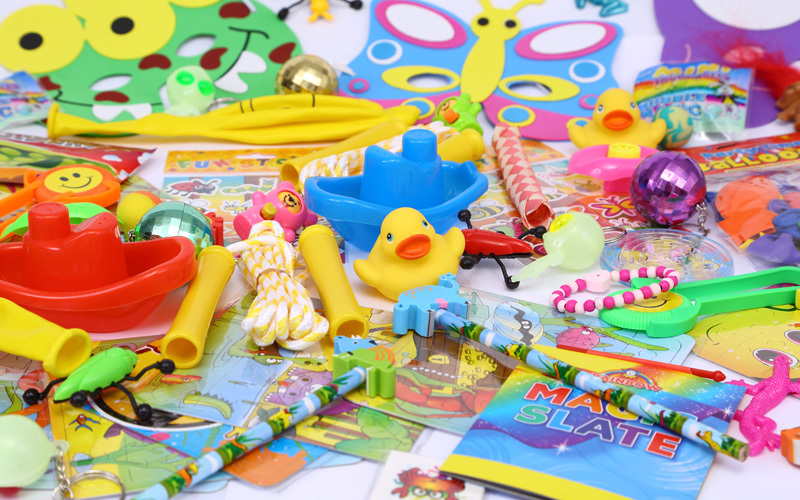 We are based in the UK so no more waiting 6-8 weeks for party bags from overseas, we look to deliver in 7-10 working days from order but normally delivery well within this time frame. Most clients tailor their branding and marketing to create a bespoke design for their party bag, our in house design team can help to create a design that matches your business. The voucher / offer area are a great way to communicate a message or offer a discount to your customers that can bring a return on investment or increase secondary spend. 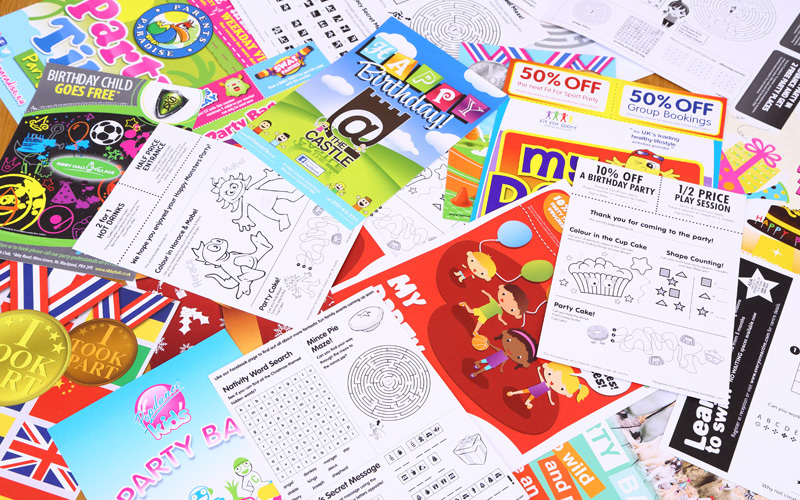 The vouchers can be tracked so you can clearly see that the your party bags are bringing you a return on investment from returning customers or increase secondary spend. 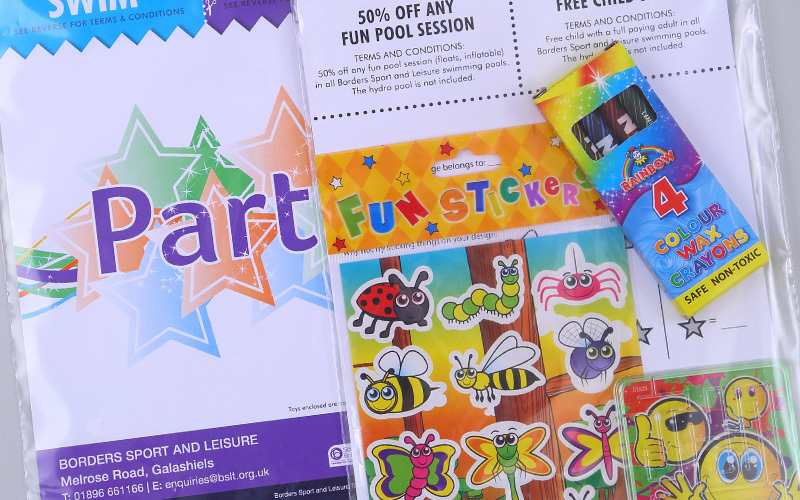 Gone are the days of generic themed party bags, what better way to market your business than lots of happy children carrying a branded party bag with your logo on. 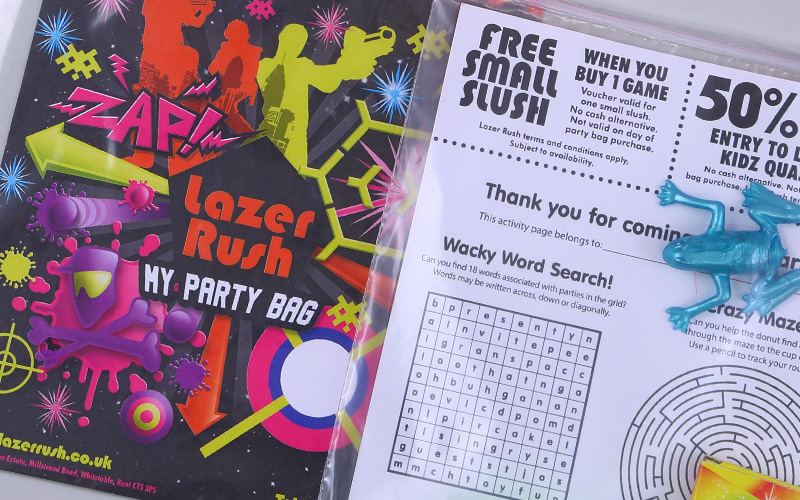 The response from the children has been fantastic, great toys and an engaging activity sleeve offers the children something different to standard run of the mill party bags. No more packing party bags, we offer fulfilment service, so if it’s just the packing side of the party bags or event bags you need help with to free up your staff then we are here to help.